Twist the individual breadsticks and lay them out in a row on a greased baking sheet. Bake for 14-16 minutes, until nearly done. Then remove and drizzle breadsticks with about 4 tablespoons (1/4 cup) maple syrup. Return to oven and bake an additional 2 minutes or until the edges of the breadsticks are golden. Remove. Meanwhile, in a small bowl, stir together 2 tablespoons maple syrup, toasted chopped pecans and butter until combined. Serve the breadsticks with the maple butter. Your favorite breadsticks go maple! All of you breadstick lovers, get ready. Your favorite easy breadsticks have just gone maple! 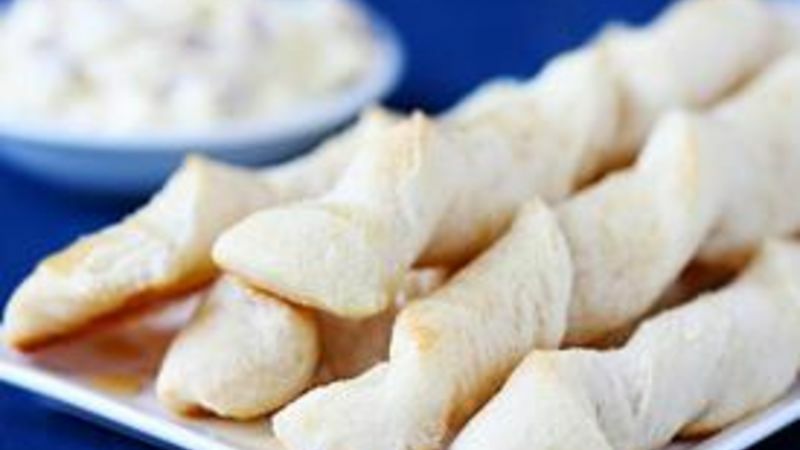 A perfect warm and sweet winter twist on everyday breadsticks. That’s right. This simple Maple Breadsticks recipe calls for drizzling these delicious breadsticks with some sweet maple syrup. But then you can also whip up a simple maple pecan butter to serve as a hea-ven-ly spreadable butter to go with 'em. Completely delicious. Completely simple. And completely ready to go in less than 20 minutes! Consider yourself warned -- you may never eat plain breadsticks again. Meanwhile, get your other ingredients ready to make the yummy maple butter. You just need some butter, syrup and chopped toasted pecans. Stir them all together until well-mixed, then serve the butter with the breadsticks. A match made in heaven! So good!